Naim Mu-so review | What Hi-Fi? 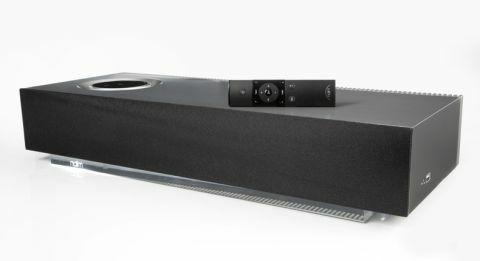 The Naim Mu-so marks the first time that the established hi-fi manufacturer has stepped into the wireless speaker market. At £895, this is an ambitious proposition, but one that has the full weight of Naim’s long-standing hi-fi expertise behind it. Expertise is all very well, but does the Mu-so have the sonic ability to prove that wireless speakers can perform to hi-fi standards? With an impressive list of streaming features matched by an equally impressive design, it certainly starts off as a seriously tempting product. We’ll admit we’re utterly taken with the Mu-so’s looks. It’s a gorgeous design. The cabinet is made of MDF, and then wrapped in a layer of brushed aluminium. Not only does this give the Mu-so its hefty, premium-quality feel, but it also improves the cabinet’s damping. The aluminium heatsink spanning the length of the speaker looks distinctive, as does the mirrored base with the subtly glowing Naim badge. A discreet LED at the side aids network set-up. The highlight, however, is that volume dial. Made of a solid ring of bead-blasted anodised aluminium, the circular, illuminated control is inspired by the flagship Naim Statement pre/power amplifier. We’ll wager you’ll spend more time physically changing the volume rather than using the remote or control app – the dial is a dream to use. It’s weighted just right, moving smoothly as you turn it all the way up to 11. We like the illumination effect, too. The dial also doubles as the Mu-so’s touchscreen interface. Tap the illuminated icons to pause or play a track, or spin the dial to select any of the three wired inputs, or to switch between five preset radio stations (you can set presets using the app). The crisp display also indicates which streaming option you’re currently using. There’s a claimed 450W of power coursing through the Mu-so’s sonic veins. Six custom-designed drivers (two dome tweeters, two midrange and two ‘racetrack’ bass drivers) are hidden behind the grille, each powered by a 75W digital amplifier. The DSP technology – a high-performance 32-bit silicon chip – has been developed from Naim’s work on Bentley’s in-car audio systems. And finally, the bass reflex port is ribbed and flared to minimise distortion. The unit comes with a standard black grille, but you can swap it for three other colours – vibrant red, deep blue, burnt orange – for an extra £70 each. There’s little this Mu-so can’t do. Naim has included nearly every streaming method into the mix, ensuring you can play songs from a wide variety of devices. There’s aptX Bluetooth, AirPlay, UPnP, Spotify Connect and thousands of internet radio stations on board. Physical inputs include a USB port (which charges and plays Apple devices as well as USB-stored music), an optical input (limited to 24-bit/96kHz) and a 3.5mm analogue input. There’s also an ethernet port to go alongside the built-in wi-fi, hidden under the unit with the power socket to keep wires out of sight. Whether you’ve got an iOS or Android device, laptop or NAS box, this Naim can play it all. File compatibility is extensive as well. The Naim supports all popular audio formats, from low-res MP3s and Spotify streams to 24-bit/192kHz WAV, FLAC and AIFF files. You get full-fat high resolution through the wired ethernet connection, while going wireless limits it to 48kHz. The neatly designed Mu-so app gives you full browsing control over your music collection across smart and NAS devices, including selecting inputs and tweaking the speaker’s EQ settings. It aids networking and multi-room set up, you can dim the unit’s lights, access track info and pick from thousands of internet radio stations. We prefer using the app to the supplied remote. While the remote is responsive and instinctive to use, the insubstantial plastic finish is at odds with the premium feel of the Mu-so itself. You’re more likely to be using your smartphone and the app for playback control anyway, but we would have liked a classier design for the handset. So far, so good. Now comes the make or break moment: does the Mu-so sound any good? In short, yes. Any ‘style over substance’ comments can be thrown out of the window. The power behind the Mu-so’s sound is astonishing. It drives all songs with a sure-footed sense of rhythm, rich detail and lashings of deep, rumbling bass we’ve never heard from a wireless speaker before. The scale of sound is huge. It easily fills our large listening room with its soaring dynamics, and the airy soundfield is as wide as it is tall and deep. Play Jim Croce’s melodic Time In A Bottle and you’ll be enveloped in a full-bodied sound that’s enchanting to listen to. Internet radio stations sound robust, too. The Mu-so charges through songs with boundless energy and enthusiasm. Notes stop and start with foot-tapping precision, instruments are accurately and cohesively laid out, and silences between notes have intensity. A demanding track such as Time from the Inception soundtrack shows off the Mu-so’s dynamic prowess – the gradual build-up is palpably tense. There’s a stunning level of subtle detail. Feed it high-resolution tracks such as REM’s Losing My Religion (24-bit/192kHz) and the Mu-so eagerly shows off the benefits of extra resolution. Every guitar strum is tangible, drums hit with satisfying impact and Michael Stipe’s vocals are clear and intimate. High notes are crisp, open and have just the right amount of bite. There aren’t any undue sharp edges to the Mu-so’s sound, and taut basslines are controlled and full of texture. The Mu-so turns its subtle hand to CD-ripped files and Bluetooth-streamed songs too. The brooding, tense tone of The Dead Weather’s 60 Feet Tall (streamed over Bluetooth) is delivered with crisp detail and tight, attacking rhythm. Kate Bush’s ethereal vocals in Watching You Without Me (16-bit/44.1kHz FLAC) are beautifully conveyed, with every intonation, plosive and emotion laid bare. The quirky musical arrangement makes musical sense, too. The powerful sound is key to the Mu-so’s performance. Our only niggle is that a slightly musclebound character rears its head when the volume is turned up. Detail and rhythm aren’t sacrificed, but the sound does thicken up just a touch. There’s no hint of hardness or brightness at any point, though: this Naim speaker has strict control over its frequencies. The Naim Mu-so is a seriously attractive product. Everything promised is delivered. This wireless speaker’s performance lives up to the spec-sheet hype – it looks stunning, and that powerful and subtle sound is as close as we’ve heard to hi-fi from an all-in-one unit such as this. It’s more than worthy of a front-and-centre position in your listening room.